This Spring, Only What We Can Carry Project took a group of current and former Bainbridge Islanders to the former Manzanar Relocation Center, a WWII concentration camp in the High Sierras of California where the Bainbridge Island Japanese American community were sent in March 1942. 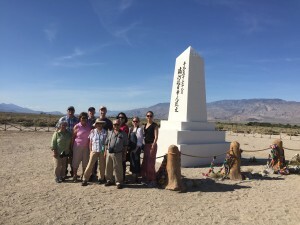 This is OWWCC’s fifth Delegation to Manzanar, a community service project which pairs local educators, responsible for teaching and learning about the Japanese American experience of Exclusion, with Bainbridge Islanders who lived through that period, many whom were the age of the students whose teachers accompany them. Our aim is help enhance and enrich the culture of a curriculum, school and community whose history is completely interwoven with this story. What will be the living messages (the stories, the lessons learned, the practices, the hopes) that current and future generations will carry about the Japanese American Exclusion after this generation who lived through that WWII experience have passed? 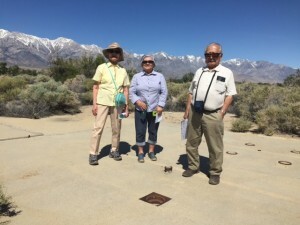 OWWCC Delegations to Manzanar have been an opportunity for Bainbridge Islanders, those that lived through it and those now responsibility for teaching and learning about this subject, to wrestle with this question. These journeys of discovery have charted new educational territory for those who have participated. This year, OWWCC brought three 11th American Studies educators from Bainbridge High School, Larry Holland, James Seemuller, and Kirrin Coleman. 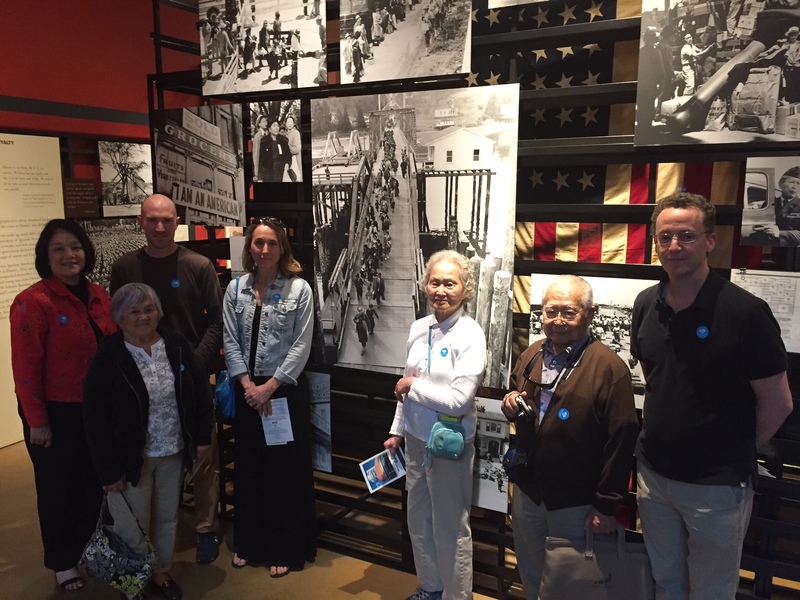 This journey of bearing witness was timed to take place the week before they would be studying US Foreign Policy during WWII and Japanese American Exclusion with their students. We were also honored to have Bainbridge Island School Distirct Superintendent, Faith Chapel, join us on this delegation. A Japanese American, Faith’s parents were both interned and met in the Poston Relocation Center in Arizona. 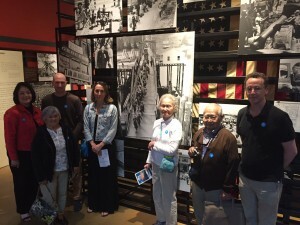 The Bainbridge Island educators accompanied Matsue Nishimori Watanabe, along with her daughter Naomi, Frances Kitamoto Ikegami, and Victor Takemoto, whose families were forced to leave their homes on Bainbridge Island during WWII (pictured L-R in photo above). Mrs. Watanabe and Mr. Takemoto were in the freshman class of Bainbridge High School, and Mrs. Ikegami was five years old, in March 1942. We are grateful to this community elders for their time and stories, so that we might better understand what it was like to walk in their shoes. We deeply appreciate how they have chosen to share the challenges and woundedness of their youth, so that upcoming generations might learn from their tragedies and triumphs. OWWCC Project Co-Directors, Katy Curtis and Jon Garfunkel guided the delegation. 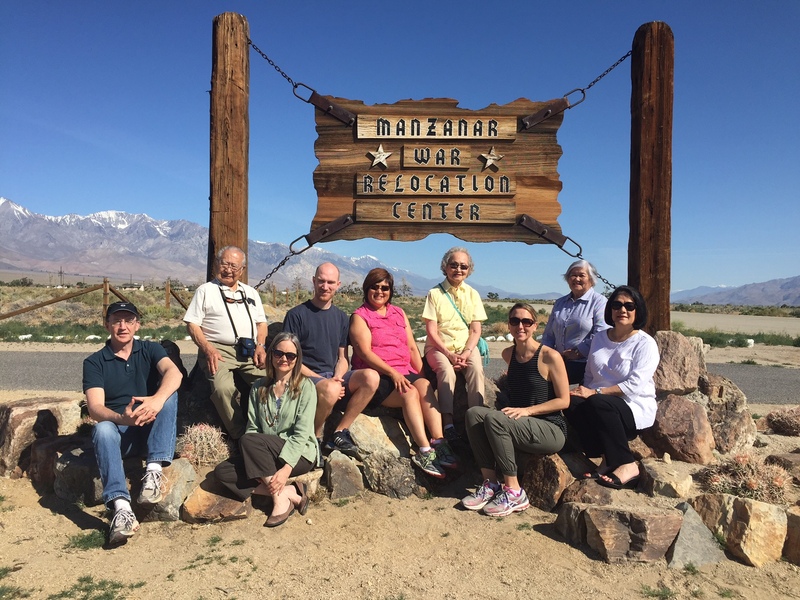 Our group is grateful to the National Park Service staff at the Manzanar Historic Site, especially Chief of Interpretation, Alisa Lynch, who made our journey of discover so welcoming, engaging, lived and meaningful. 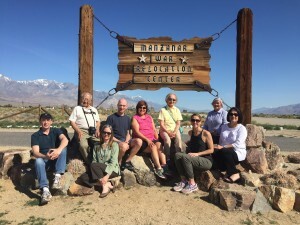 Click here to learn more about OWWCC’s Delegations to Manzanar. This entry was posted in Only What We Can Carry, Professional Development by EduCulture Administrator. Bookmark the permalink.